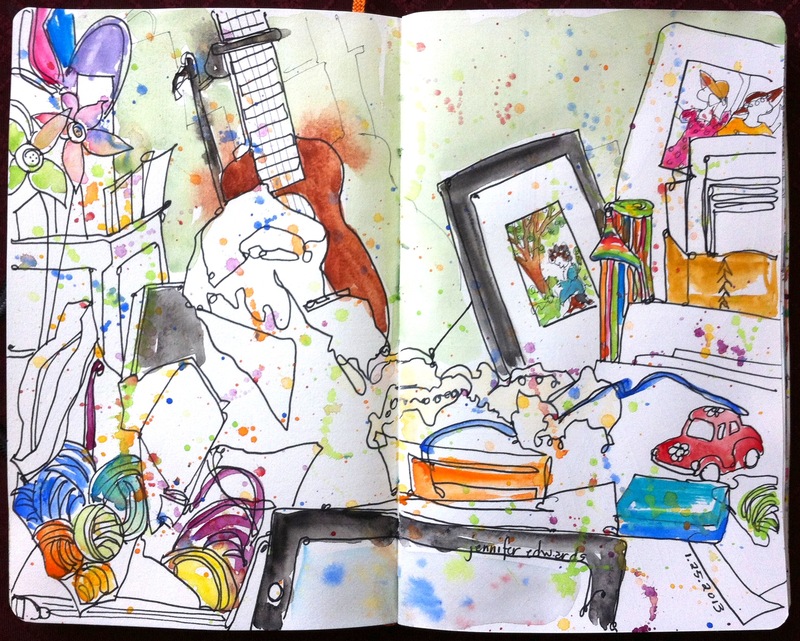 Early this morning I felt the need to draw the chaos that is my desk. A true picture of the shape of my life right now: mounds of papers from school (both mine and my kids), yarn, end-of-year tax gathering, yarn, knitting patterns and projects, yarn, books I’m “reading”, oh and did I mention yarn? For whatever reason, I just needed to draw it. This is me, my life right now. It wasn’t bugging me too badly at all. There was actually some sense of delight in the flurry of stuff! But what happened immediately upon drawing the chaos, I cannot explain to you. Crazy, this drawing life. It continues to amaze me. This is so funny,since I’m the opposite: very orderly with materials, projects, etc., because it drives me mad otherwise. But my late husband was, um, very freestyle,and the only way I could tolerate the chaos he created in the house was to draw it! once I saw it as raw material for art, things went better, and some of my better line drawings came from it. It worked both ways, though, since he learned to check before taking a piece of fruit from a bowl, or putting on his shoes, to make sure they weren’t my current models! What an awesome story Liz! Thanks for sharing it!!!! I love this idea of “resetting” the stage…cool thought! And I think I’d like to have a button like that! Thanks for visiting and commenting! Scary how quickly this happens, ten minutes, and everything descends into choas. Have a productive week-end. Russell. Yep. It doesn’t take long! Happy drawing Russell! so, draw the pain and away it goes. You got it, girl friend. It might work that way, dad! Someone I know who does embroidery says that it took her pain away post surgery on her leg…at least WHILE she was creating. Afterwards, the pain seemed to return. Art is a powerful thing. Maybe if I draw the constant battle with clutter in my house I will come to not let it stress me. This is a great sketch! I love the comment about the upside down sketch book. That is SO something I would do. Thanks for sharing. Did you find that the drawing also helped you feel a bit more organized in the process. I don’t know why, but storing these types of moments in my sketchbook has the same kind of feeling as placing it in a folder in a filing cabinet. Yes! Yes! Thanks for articulating that! I just drew my sweet daughter who is sick with a virus today:( and it felt like I could get a grip on this and handle it. Not quite like filing it, but gives me a way of managing it. Thats funny, because sometimes if Im kind of stuck in my fab mess… meaning cant find the inspiration or modivation to tidy up, I take a picture and then when I see how mad it really looks I cant stand it and it gets all cleaned up. Its hard to keep it all together right now with my work space frozen shut and I have to use all other table surfaces in the house, my poor husband is doing well but I know its driving him batty : ) Great sketch of your wonderful mess!! !